First, its global licensor took back QuickBooks, the household brand name. Then the dream deal with MYOB evaporated. Now shares have fallen from blue chip to nearly penny stock. And yet Reckon’s managing director, Sam Allert, puts out an impenetrable air of cheerfulness. “I’m keen to give the other side of the story because it’s not as scary as you might believe. I do have to step outside of Reckon’s celebrations to do so,” Allert said in a voicemail last Friday, 24 hours after MYOB decided not to acquire Reckon APS. Allert was calling in response to a widely shared interview with MYOB CEO Tim Reed published on Digital First in which Reed sounded more relieved than disappointed. Where does Reckon go from here? Allert says it’s back to business as usual which includes taking APS to the cloud, that customers have nothing to worry about, and that no more deals are on the table. The effects of the Proposed Transaction must be assessed against a likely counterfactual. To this end, there is no prospect whatsoever that Reckon will move its APS suite to the cloud. As [REDACTED], and it has stated (as a listed company), it simply does not have the resources (nor the time) to do this. As a result, its constraint on the market will decline. Indeed, it is already declining, as evidenced by [REDACTED]. So what’s the truth? Read the interview below and add your thoughts in the comments. Digital First: So Sam, what happens now? Sam Allert: We continue with our plan. We always had a plan before the transaction was discussed, we were committed to the transaction, and we have continued on with the plan because there was always regulatory risk. We 100% get that we have to take it to the cloud. We’re not going to call our clients one day and say we have a verison in the cloud. We have spoken to clients about a Cloudification journey. We recently released Practice Manager v11, which is free for clients. It hasa client hub which is the ability via browser or mobile to review the APS database (read-only). It has mobile/cloud timesheets. And it’s got reports on a browser and mobile. That release got finished in the last six months, it was released three months ago and we are seeing huge takeup from clients. That gives them a connected practice today and starts their journey on the cloud. Digital First: Didn’t Reckon say it wasn’t going to make a cloud version of APS? Sam Allert: No, we never said that. When Clive (Rabie, Reckon group CEO and founder) announced the deal he said that it would have been difficult for us. That was at the time of the transaction. What Clive was saying was that we had a tough few years where we had accounting and business products that were desktop based, so for Reckon it was which one do we take into the cloud first? We have broken the back with that for Reckon One, that has been a huge investment in money and time. That take-up is just starting. Digital First: But didn’t you just say that moving to the cloud would be difficult? Sam Allert: That was at the time of the transaction. That was justifying a trans and why we would accept it. He was talking to investors and shareholders. We think we have the best team, the best customer base and the best product. Digital First: The best product? But KPMG just went with MYOB Accountants Enterprise? Sam Allert: KPMG ran APS for 5 years and they went back to AE. They have a five year agreement and for the next five years they will go with AE. Of course we don’t like losing customers, but if you look at second tier firms we have Bentley, Walker Wayland, etc. Yes, you can mention one big high profile firm turned off APS but the reality is that it’s highly, highly the other way. One of the issues with the ACCC was that most of the clients had left MYOB to go with APS. We have had a huge influx of clients. We were selling the transaction to them because we were committed to it, but we had a huge influx of clients from MYOB. Digital First: How many sales have you made in the past six months? Sam Allert: That would be an unfair way to look at it. It’s been a very slow business period. I was talking about the 12 months previous to this. Everyone has been in a watching mood, saying ‘Let’s see what happens’. That’s the good thing about certainty – we have absolute focus and absolute clarity, we just carry on. Digital First: How do you rate yourselves as having the best team? Sam Allert: On experience we have so many people who have been in the industry, for 10,15, 20 years plus. We have a lot of longevity in the team. That brings experience and relationships. I think what we do with our team, the results we get and the clients we‘ve got, we have the best team. And the clients tell us this. Clients were very happy that the APS team was included in the deal. Potentially it’s also a sign of the experience they have had with competitors. Digital First: How can you fund the R&D? Sam Allert: The reality is that we have always been a profitable organisation. The share price might not indicate that perfectly but we do have a lot of free cash flow and invest in the products we choose. We had a number of years investing in Reckon One and we can leverage what we have learned in that space. We were merging teams together and had to stop it because of the transaction. We can continue leveraging some of those platforms and code bases and help take practice management to the cloud. We already have Reckon Docs in the cloud. One in 10 entities are created in Reckon Docs. 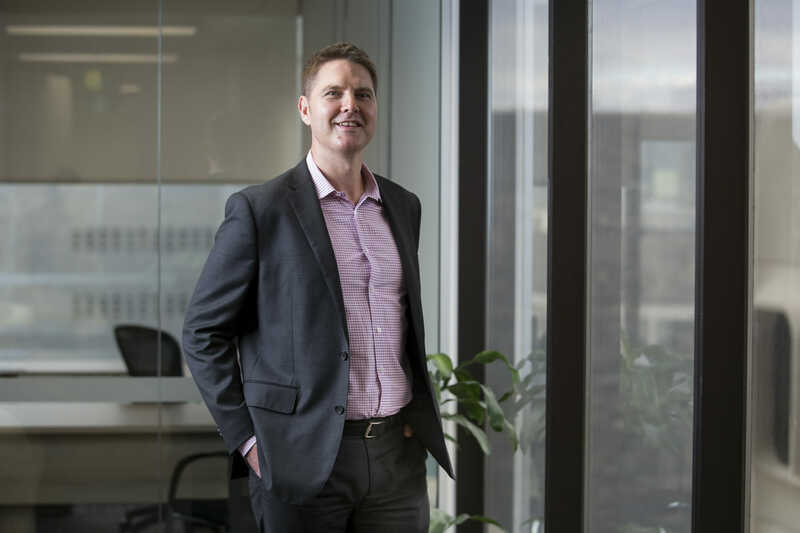 We offer them free cloud accounting with Reckon One, and we talk to the accounting practice about their big data strategy and their one process for collecting data with Reckon Sync Direct. No matter what (accounting software) their clients are using the firm can get the data in with one process. And then you have this big data of reporting. Digital First: I have heard there are issues with Sync Direct because competitor vendors were forcing a reset of the API connection? Sam Allert: There are no issues. It can sync as often as you want. It could sync hourly, daily, weekly, monthly, quarterly. You can say, for this particular client I want this data on a weekly or monthly basis because I’m doing more work with them. The data we integrate from Xero, MYOB, Intuit – they are publicly listed companies. If they were playing games like that I would be a bit disappointed. Digital First: I thought APS doesn’t have a published API to connect to cloud services? Sam Allert: We have already broken the back of the API in terms of the development. It’s not a published API, but we do have one. It’s called the Cloud Connector API. Anyone can connect to it, but Joe Blow down the street can’t start integrating to the API. We write the integrations for you. Digital First: I hear it’s really expensive to do that? Sam Allert: No, it’s not expensive. Digital First: You are presenting a very rosy picture, yet analysts are calling Reckon a sunset business. Why? Sam Allert: Look, my work is running the business. We had this plan, yes we thought that was an attractive deal (with MYOB), we were committed to that, and now we are committed back to (our plan). We are pretty excited about the future as well. Digital First: But why exactly did Clive Rabie say going to the cloud was going to be difficult? Sam Allert: Excellent question, but I don’t know what he was referring to. That was his comment. Digital First: What about your APS clients? Are they worried about the future? Sam Allert: It was definitely an uncertain seven months we had. Now we know with clarity we are not selling and we continue to drive the business forward. We speak to our clients daily, weekly, they are attending our events, we have our consultants on site – we are also getting that feedback from clients. Some do get caught up in mistruths and others just get it straight from us and are enjoying the product direction. Digital First: How much certainty can you give your clients that you will have a future? Sam Allert: Great question. We give certainty like this: We are an ASX listed business. If there is any discussion about selling APS we have to disclose it. We were committed to the deal, I can tell you categorically that we are not talking to anyone else. Digital First: Can you give a guarantee that you’re not going to sell? Sam Allert: We can’t give a guarantee. What if MYOB turns around and says we do want to pay $180 million, or an international player says we will offer you $250 million? Obviously the Reckon board has a responsibility to accept all reasonable offers. We had found new premises in North Sydney and we planned a big fit out, but we said there’s no point moving the business (when the deal was still alive). We are moving all our Accountants Group (122 people) to the new premises. If we were just thinking let’s sell to the next-best bidder we wouldn’t be bringing the rest of the team over to our new premises. I also want to say a massive hat’s off to the AG management team, they have delivered a massive amount in terms of releases, working with clients. Digital First: How much will it cost to bring the next stage out in APS’ cloud journey? Sam Allert: I don’t have all those financial forecasts in front of me. We are coming to our half year results and will need to wait to spell that out correctly. Digital First: When is the next version coming out? Sam Allert: Practice Manager v. 11 is out now, and it will just be continuous (iteration). The development days of work on a product and do one big release, they’re gone. People talk about iterative development cycles, so we just start building it out further. That Cloud Connector API helps us build those pieces. Digital First: What features are coming next then? Sam Allert: Two big things – more and more practice management functionality on the cloud and tax in the cloud. We have ledger, Sync Direct, Reckon One, reporting, time sheets, the Client Hub, Reckon Docs. Again with tax – we’re not going to send out one version in the cloud. It will be iterative. Some are saying just give us a cloud interface and have the tax data on premises. And others want it all in the cloud. Digital First: What are you specifically releasing on practice management? Sam Allert: I don’t want to give too much away. We are focusing on v. 11 now and we will give more detail on upcoming features in Reckon retreats. Honestly – the next release is practice management functionality and tax in the cloud. We are focusing on interfaces for interacting with your system on your browser or mobile device out of the office. Digital First: Do you need to make a big investment to comply with Single-Touch Payroll? Sam Allert: We have already done that, the first release where everyone has to go out this July for 30 employees and up. Our team have done the STP integration and that platform we can leverage for other ATO integrations down the track. Would be interesting to get the view of a market analyst on these comments. Hi Sholto. I am usually a fan but that was possibly one of your worst. Sorry. That was just a really poor question that highlighted a lack of understanding. That said, you are not alone. A lot of my CPA colleagues didn’t understand what Reckon were and were not selling, or why MYOB would be buying (me included) but you should be more informed. You usually are. Secondly, read between the lines. To get the MYOB deal over the line, if you read Reckon’s submission, it really talks APS down. Even to a humble old accountant like me it is obvious they did this to try and get the deal over the line. Imagine an APS team member reading that! They would be horrified. I am sure they were “clued in” even if Mr Allert skirted around that question. Maybe you know this and were just pressing him, but when I read this article versus your love-fest with Tim Reed it does’t really smack of impartiality. As I said, I am usually a fan, but this wasn’t one of your best. Thank you for the feedback, David. I really appreciate it. Re: impartiality, I don’t play favorites. But all opinions are subjective, even if as a journalist I do aim for impartiality. Do I think that MYOB is in a better position than reckon? Yes. I would say that the facts bear that out. Do I think that reckon needs to justify an overly rosy outlook? Yes I do, because I think the facts show that they are in a difficult position. Ultimately I am trying to ask the questions which I think illuminate the truth, because that is how I justify my relevance to my readers. But I will take your points under consideration. Thanks again. Thank you for responding Sholto. I just wanted to make sure I had my facts straight, and indeed I do, or should I say, did. Reckon released STP for all 4 of their desktop and cloud payroll applications yesterday, plus a new STP app. Looks like Mr Allert was spot on. STP is the largest change to ATO compliance in a lot of years – one could suggest this compliance burden on business (not just small) would be ideally placed into a product like APS as part of a greater software offering. Good question would have been how many customers have they lost in the last 6 months… I know of several, APS is a dead duck last person out please turn out the light. MicroManager Apps is still waiting for Reckon to pay the license fees for the mobile, cloud based time tracking software. They have used big brother tactics to grind down a startup after they requested co operation. The mobile time sheet software was developed with a large investment by MICROMANAGERAPPS Ltd in NZ. Why wont Reckon resolve the dispute over license fees with them?